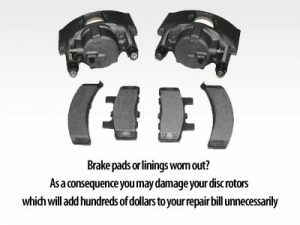 When it comes to brake maintenance, don’t wait until you feel your brake pedal pulsate (unless you have antilock brakes, in which case a pulsating brake pedal would be normal in heavy braking situations), hear that high-pitched squealing (caused by the warning bar and indicating your brake pads are just about gone), or hear a harsh scraping noise, before you check them out. Most experts agree that your brakes should be checked about every 15,000 to 20,000 kms, though this can vary depending how you drive. Brakes can be tricky — let a professional make the assessment. Be sure you also remember to check your brake fluid. The brake fluid should be monitored monthly, and fluid added as necessary. Make sure to check your owner’s manual for the proper fluid. It’s important to be sure you’re on top of the situation when it comes to brakes, because neglecting them could lead to serious problems. If you wait until you hear strange noises coming from your brake system, you may already be causing damage to your brake drums, pads or rotors. This could mean extensive repair costs or, potentially, serious injury should your vehicle’s brakes fail in an emergency situation.